Demonstrators protest against President Trump’s travel ban outside the U.S. Supreme Court in Washington in January. Polarization on illegal immigration is a two-way street. The GOP gets most of the attention, and indeed a hardline immigration stance has become a defining issue for Republicans. But Democratic voters have become far more liberal on a slew of measurements regarding illegal immigration over the past decade. It was only 11 years ago that a majority of Senate Democrats voted in favor of the Secure Fence Act of 2006, which called for 700 miles of fencing along the U.S.-Mexico border. It was just 10 years ago that Sen. Bernie Sanders voted against comprehensive immigration reform. It’s hard to imagine either of those things happening now. And that polarization could come into play if the White House and congressional Democrats reach a deal on the Deferred Action for Childhood Arrivals program. Long before Trump made building a wall along the southern border one of his main campaign issues, some Democrats were open to the idea of fencing along the border. In a May 2006 Gallup survey, before Congress voted on the Secure Fence Act, nearly 40 percent of Democratic voters were in favor in favor of “building a wall along the border with Mexico.” And support for a wall generally held through the first part of this decade. In the lead-up to the 2010 midterms, when John McCain aired an ad in which he said “complete the dang fence,” 46 percent of Democrats were for “building a wall or security fence along the U.S.-Mexico border to stop illegal immigration,” according to a Fox News poll. 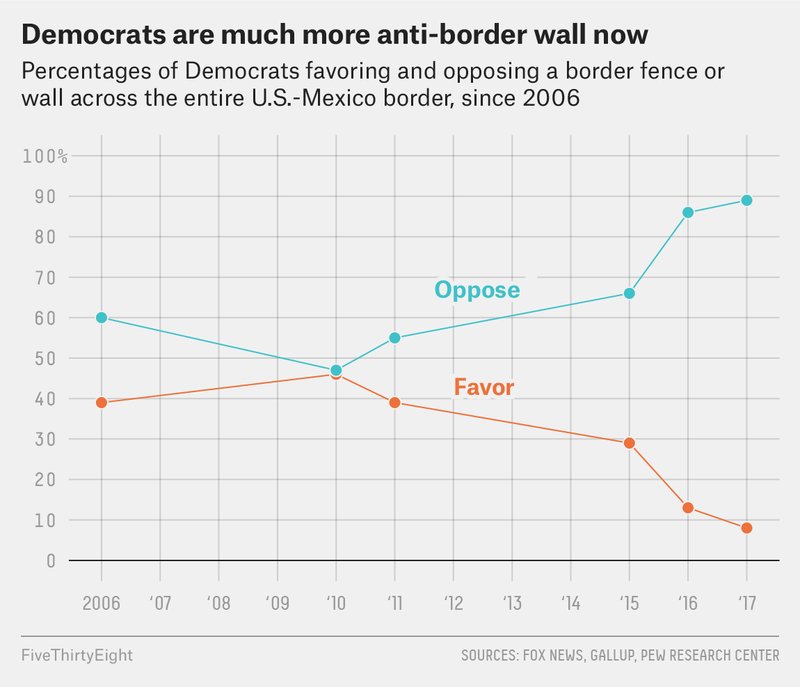 More recently, however, Democratic support for a border wall has plummeted. Support dropped to just 29 percent for “building a wall along the entire border with Mexico” in a Pew Research Center survey in September 2015. And by February of this year, just 8 percent of Democrats were for it in Pew’s polling, while 89 percent were opposed. Democratic voters have also become far more in favor of granting citizenship to immigrants in the country illegally. To be clear, Democrats have always been in favor of a path to citizenship. In a January 2006 Time/SRBI poll, 72 percent of Democrats favored “allowing illegal immigrants now in this country to earn U.S. citizenship if they learn to speak English, have a job and pay taxes.” But that still left a sizable minority of Democrats, 24 percent, opposed to such a proposal. In fact, Republicans were actually slightly more likely than Democrats to say they were in favor, at 77 percent. 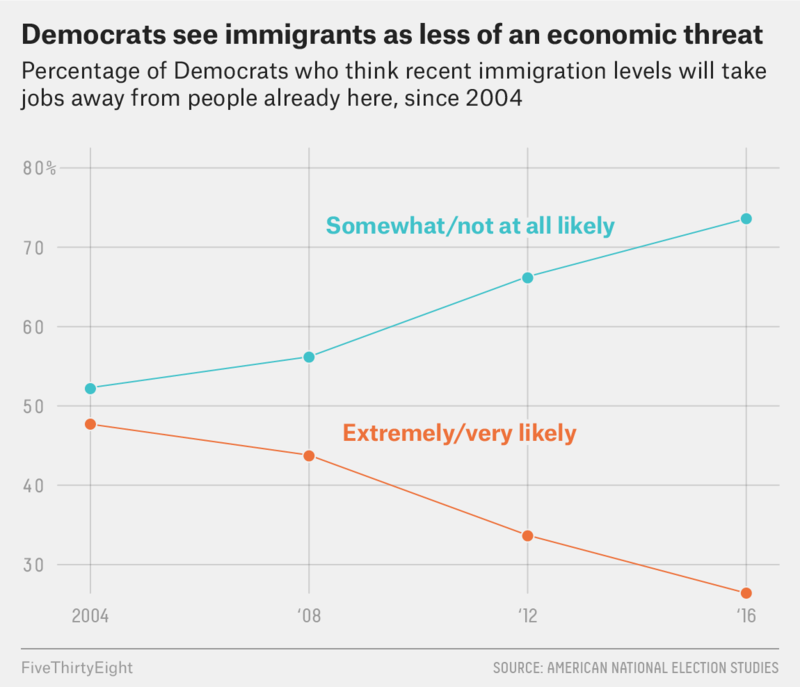 Democrats may have become less stringent on illegal immigration because they don’t view immigration as an economic threat as much as they used to. The idea that illegal immigration could hurt employment and lower wages was a big reason Sanders came out against a bill for comprehensive immigration reform in 2007. The American National Election Studies don’t ask about illegal immigration specifically, but since 2004 they have asked voters, “How likely is it that recent immigration levels will take jobs away from people already here?” In that year, nearly half (48 percent) of Democrats said it was extremely or very likely that immigration levels would take jobs away from people already in the country. In 2016, only about a quarter (26 percent) of Democrats said it was extremely or very likely. The trend downward was occurring even before Trump decided to run for president, suggesting polarization on immigration isn’t solely because of Trump. 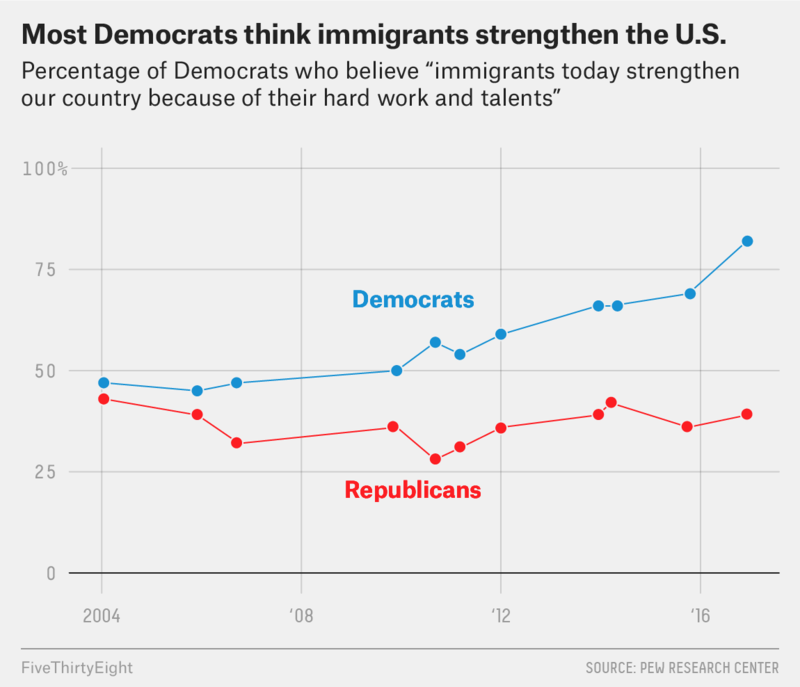 Similarly, the Pew Research Center has found that Democrats were becoming much bigger believers in the idea that immigrants strengthen the country rather than being a burden on it long before Trump came on the scene. Whatever the cause of the Democrats’ move to the left on illegal immigration, it’s clearly happening. And as the congressional debate unfolds over DACA, this polarization could play a key role in whether Democrats and Republicans can reach a deal. If a straight up-or-down vote occurs in Congress (not a guarantee), DACA will probably need only a few Republican votes to pass because Democrats are in near unison in how they now view immigration, and illegal immigration in particular. But Republicans and the Trump administration can likely ask only so much in exchange for codifying DACA — Democrats are far less willing to compromise on immigration than they used to be.